The new Microsoft Surface Tablets and PCs have just hit the market and Windows 8 now comes in several different flavors. Many people are still unaware of the small differences among the various available versions and might be confused which version of Windows 8 to choose. This article is for those people. It attempts to clearly explain the similarities and differences among the different Windows 8 versions and helps you to choose your Windows 8 computer according to your personal needs. 5 Which Windows 8 version to go for! Windows 8 offers the basic package of the latest Windows release. This version is targeted towards home users and includes all basic features (like the Start Screen, Modern UI, Microsoft Account integration, Windows Store Integration, Internet Explorer 10, Windows Desktop and more). All home users can opt for this version as unlike Windows 7 (which had Home Basic, Home Premium and Ultimate versions having different features disabled or enabled according to the installed version), they will get all the necessary features in Windows 8. But if you are a techie and want to explore several administrative features that Windows 8 has to offer, the Pro version is for you. Windows 8 Pro includes additional features like Remote Desktop, Windows Server Domain participation, File System Encryption, BitLocker, Hyper-V, Virtual Hard Disk, etc. This version is meant for power users who want to run Windows on a higher administrative level and want to have more control on their PC. Software: Both Windows 8 and Windows 8 Pro are designed for the usual desktop and laptop architectures (x86 and x64) and will be able to run Legacy Desktop Applications (normal applications running on previous Windows versions meant for the non-touchscreen interface) as well as the touchscreen apps from the Windows Store. Due to high licensing costs, DVD playback support is no longer available with Windows Media Player; Windows Media Center does not come bundled with Windows 8 and is only available for the Pro Version as a free add-on. Windows 8 users can optionally buy the Windows Media Center along with the Pro Pack, which will automatically upgrade their system to Windows 8 Pro. 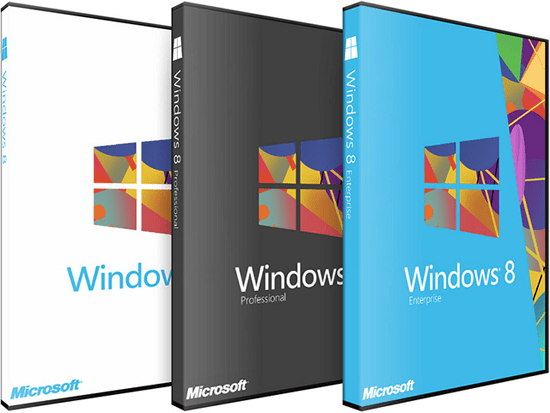 This version is meant for Corporate Organizations and includes all features of Windows 8 Pro but does not include the Windows Media Center add-on update. It is available to Software Assurance customers and also to MSDN and Technet Professional subscribers. Windows RT is meant for a completely different system architecture. It’s Windows 8 alright, but this version has been specifically designed to work on ARM based mobile architectures. It’s lightweight, allows a full touchscreen PC experience and does not allow Legacy Desktop Applications to run on it. You will not be able to run conventional desktop applications on a Windows RT computer. However, Windows RT will have full support for running Windows Store apps. Additionally, Windows RT also comes bundled with free Office 2013 apps. Windows 8 users would have to buy Microsoft Office 2013 separately. Consumers running Windows 7 will be able to upgrade to Windows 8 easily. However, it is to be kept in mind that Windows RT is designed for a different architecture and PCs currently running Windows 7 aren’t compatible with it. Hence an upgrade to Windows RT isn’t available. Windows 7 Starter, Home Basic and Home Premium Users can upgrade to Windows 8 or Windows 8 Pro; Windows 7 Professional users can upgrade to either Windows 8 Pro or Windows 8 Enterprise; Windows 7 Ultimate users can upgrade to only Windows 8 Pro; and Windows 7 Enterprise users can upgrade only to Windows 8 Enterprise. Which Windows 8 version to go for! If you want to have a PC that is able to run all your old programs, Windows 8 or Windows 8 Pro must be the choice for you. If, however, you are planning for a purely mobile touchscreen experience, Windows RT should meet your requirements pretty well. Sure, there would be no legacy applications support, but would you like to use your old desktop applications on a touchscreen PC?